I'm doing something a little unconventional on the blog today and sharing a bit of my blogging backstory. Other bloggers + women who are interested in fashion blogging, listen up! When I was daydreaming about starting my blog, I had NO clue where to even begin- specifically with making a website. I had followed so many fashion bloggers for years and always envied their lifestyles, but I was completely clueless as to what it would really take to start my own. I was under the impression that maybe I didn't even need an actual blog.. Maybe I would just post my photos to instagram, and that would be the end of it so I didn't have to mess with creating something I knew nothing about. I quickly found out that while it is possible to be a fashion influencer who doesn't have a website/blog, it was really difficult to actually make any money, appear legitimate to my followers, or land brand collaborations without a professional-looking website. Luckily for me, I happen to be married to a man with 8 years of experience owning a design agency where he is responsible for designing and managing tons of websites for his clients. He was super excited about the idea of me starting a blog (all of you lovely ladies with less-enthusiastic husbands, props to you- I don't know how you do it all alone!) and pretty quickly began designing a website for me, and he made it look better and more professional than anything I could have even imagined- much less EVER created on my own! To this day, my most frequently asked question by my followers on any social platform is "How did you make your website?!" My answer has always been- I honestly don't know, my husband did it all! ;) But here is what I've learned... People. Notice. Nice. Websites. Are Websites Really Still Important? 1. I wanted to look legitimate as a blogger from the very first time I posted- I wanted to give value to my followers. Personally, I wasn't interested in providing them outfit posts without generating the value of where they could purchase the outfit. It was nearly impossible to give them this information without having a website to hold links to the outfits, especially before being accepted to rewardStyle. 2. I also wanted the possibility to make my blog profitable through affiliate commissions as soon as I started it. I knew that I wouldn't be accepted to rewardStyle before posting any content, so I applied directly to several store's affiliate programs and was accepted right away to the majority of them. Without a website, I wouldn't have had a place to house those affiliate links or earn any commissions in the early days. 3. It made me look more professional as an influencer from a brand's perspective. All of the larger brand collaborations I've had have specifically asked for blog posts- not just social media posts. It provides more value for them when bloggers can give specific info regarding their brand and each product they're showcasing. It also shows that you're serious about your business/willing to put the extra effort in for the blog posts, and I believe it makes them more ready to reach out to you in the first place. 4. It is important to me to use every platform that I have available to push my content. Having a nice website to host blog posts as well as daily outfit updates helps me reach a greater audience. With my blog posts, I'm able to post to a broader range of social media platforms and search engines AND create a call-to-action (such as email capture) in doing so. I also love that I actually own my website and get to fully control it's contents. I don't have to worry about algorithm changes, etc. on my own website and in the social media frenzy, sometimes that can be very comforting to me. Once I knew that I needed a great website for my business and my husband was able to create it, he was so sweet to educate me on the website platform he used to create our site and how I can manage it myself. I was beyond pleased with the way that the site looked but still didn't know how to actually do anything with it on my own once it was created. 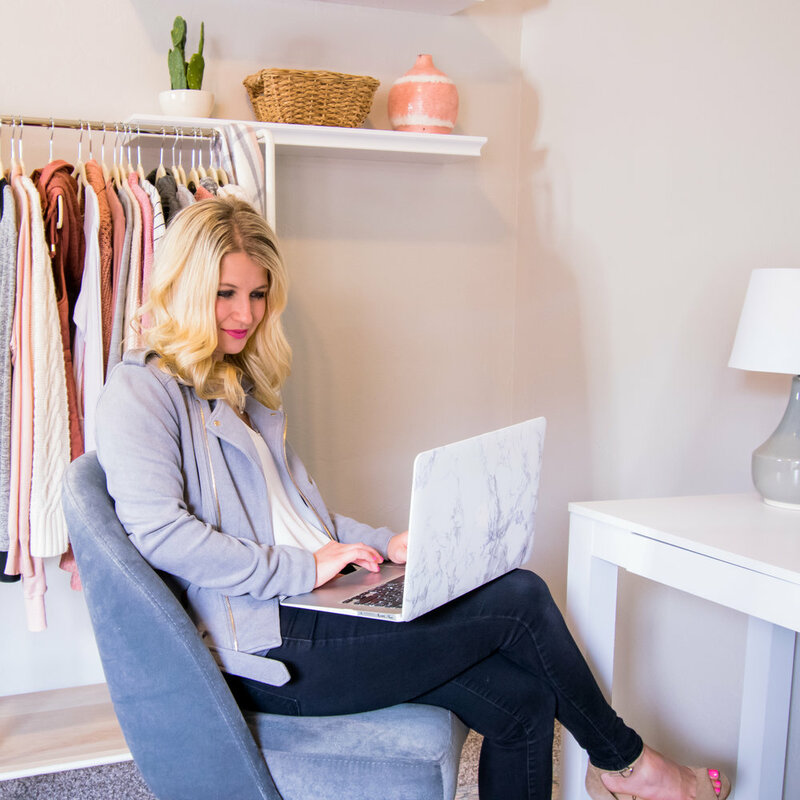 Cody was able to walk me through step-by-step how he designed the site and then show me how simple it was to write my blog posts, add my daily outfits to automatically renew on my site, add links from my try-on's, etc. I can honestly say that since that first day, I don't think he has ever had to help me with the basics of managing the site day to day on my own. SquareSpace is very user-friendly! Want to Make A Website? We Want To Help! We have included not only information about how to build a professional website from scratch, but also how to come up with a name for your blog, a logo, a domain name, and many other valuable skills to help you build your business from the mouth of a man who is genuinely paid to do this everyday. We have also included everything you will need to know about how to manage your website in the future as well as lifetime access to the course to re-watch portions/receive updates as changes to the web platform occur. You will save thousands of dollars through the use of this course vs. hiring an expensive website developer as well as learn the valuable skill of creating/managing your own site!